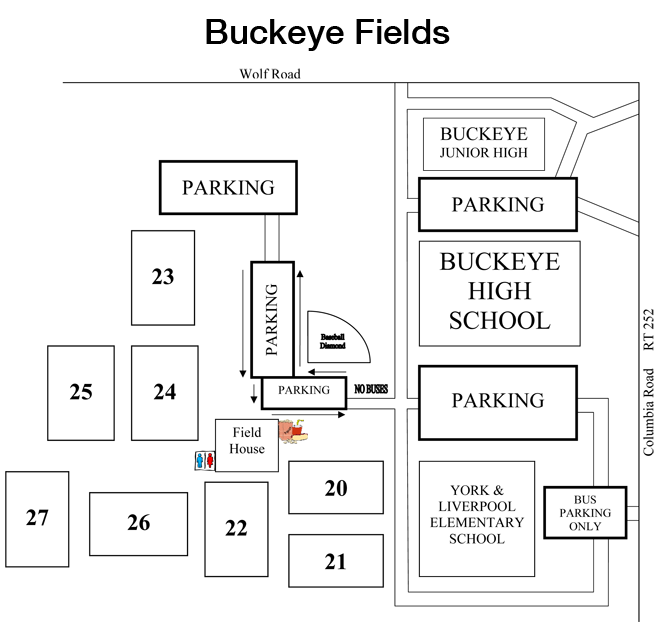 Buckeye fields is somewhat distant from the other fields featured in the Showcase. Please allocate additional time (20 – 25 minutes) for travel to this location. South (left) 0.5 miles on Foltz to West Lunn Road. Right on West Lunn Road 0.4 miles to Marks Road. Left on S. Marks Road 4.1 miles to Center Road (303). Right on Center Road (303) 2.3 miles to Columbia Road. Left on Columbia 3.3 miles to Buckeye High School. East (left out of Parking lot) less than 0.1 miles to Prospect. Right on Prospect 1.0 miles to Boston Road. Right on Boston 0.1 miles to Substation Road. Left on Substation 2.6 miles to Center Road (303). Right on Center 3.2 miles to Columbia Road. Left on Columbia 3.3 miles to school on right. Left on Prospect 2.1 miles to Boston Road. Right on Boston Road 1.0 miles to Marks Road. Left on Marks Road 2.6 miles to Center Road (303). Left on Columbia 3.3 miles to Buckeye High School on right.